Correspondents say the reference to foreign intelligence agencies was intended to mean Saudi Arabia. Iran has imposed “temporary” restrictions on social networks Telegram and Instagram. The decision was taken “to maintain tranquility and security of society”, a source told state news agency IRIB. Telegram CEO Pavel Durov tweeted that the action was taken after his company refused to shut down channels on the messaging app used to organise peaceful protests. 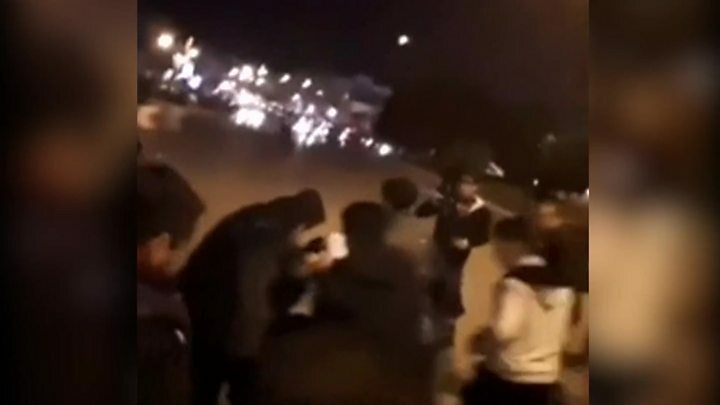 Protesters in the cities of Khoramabad, Zanjan and Ahvaz called for the removal or death of Iran’s Supreme leader, Ayatollah Ali Khamenei. Iran’s Islamic Revolutionary Guards Corps is a powerful force with ties to the country’s supreme leader, and is dedicated to preserving the country’s Islamic system. “Those who damage public property, disrupt order and break the law must be responsible for their behaviour and pay the price,” Abdolreza Rahmani-Fazli said. There is widespread and seething discontent in Iran where repression is pervasive and economic hardship is getting worse – one BBC Persian investigation has found that on average Iranians have become 15% poorer in the past 10 years. Protests have spread to even small towns throughout the country and have a potential to grow in size. Even in exile, there is no one opposition figure that commands a large following. Some protesters have been calling for the return of the monarchy and the former shah’s son, Reza Pahlavi, who lives in exile in the United States, has issued a statement supporting the demonstrations. But there are signs that he is as much in the dark about where these protests are going as anyone else. BBC Persian, which broadcasts on TV, on radio and online from London, is banned in Iran – where staff and their families routinely face harassment and questioning from the authorities. Iran is a key provider of military support to the government of Bashar al-Assad in Syria. It is also accused of providing arms to Houthi rebels fighting a Saudi-led coalition in Yemen, which it denies, and is an ally of Lebanon’s powerful Shia movement Hezbollah. Iran’s foreign ministry called earlier comments from Mr Trump and other US officials “opportunistic and deceitful”. Iran’s Islamic Revolution Guards Corps (IRGC) was set up shortly after the 1979 Iranian revolution to defend the country’s Islamic system. It has since become a major force in the political, economic and military life of the country, with its own ground forces, navy and air force. It controls a volunteer militia of tens of thousands of people – the Basij Resistance Force. Its stature says it will co-operate with law enforcement forces “when necessary” but there has been some controversy over its scope when dealing with civilians. ← Missed this week's entertainment news?